What I like about a card like this is that even after the holidays are over, you can just cut off the bottom and use it to display all year round! It would look really good in a frame too! Looking for a great gift for your parents or in-laws? My mother-in-law actually requested a photo calendar this year. I made one of these for her last year and it was obviously a hit. 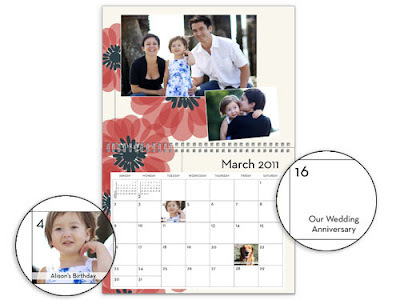 I think the best part is that you can personalize the lower half too and even put pictures on certain days, which is great for those birthday reminders! They also have tons of great photo gifts, which I have found to be the perfect solution for those people you just don't know what to buy for. 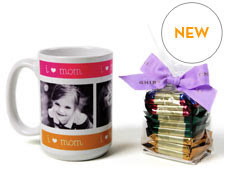 I love this photo mug filled with Ghirardelli chocolates. 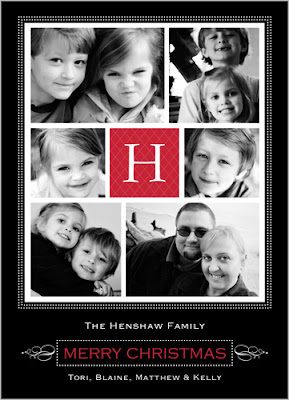 Place a picture of your sweeties on there for a grandparent, or a fun picture of friends hanging out and give it to one of your friends. Plus, orders that are $30 or more ship for free! Just use promo code SHIP30 when checking out. So, what are you waiting for? Head on over to Shutterfly and get your shopping done! This was the conversation in our car after dropping Addie off at school this morning, listening to "He's Got the Whole World in His Hands:"
Millie: Mommy, did you hear that? They said sister! Me: Yes, Millie. And you're a sister. Isn't that neat? Millie: Yeah, but why is she a really mean sister? Me: Who's a really mean sister? Millie: The girl in the song. They said, "He's got your really mean sister in his hands." Me: *stifling a chuckle* No, they said, "He's got you and me, sister, in his hands." Millie: Oh. I like that better. Oh how I love our conversations. This is a continuation from yesterday's post. For the full story, you'll have to read that first! So, there I was... grasping with all my strength to the rock, losing my battle with the current, and trying not to look at the deathly terrifying sight below. Much to my relief, within what was probably just a matter of seconds (although to me it seemed much longer of course), I saw my salvation. Two boys from our group, Aaron and Brian, had made their way to the rock that I was clinging to. There were other large rocks leading from the shore to my rock, so they were able to hop across those and make it to me in time. One of them pulled me out while the other one rescued my canoe. And it's a good thing. 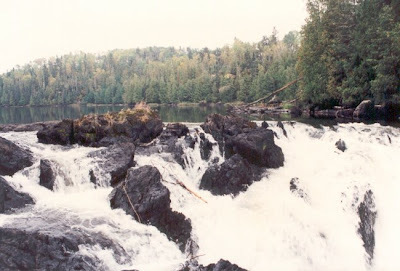 A few days later when we arrived back at the outfitters, we mentioned the incident and the guide informed us that once a canoe had gone down those falls and wrapped itself around one of the boulders like a piece of aluminum foil, where it remained for several years. That could have been me were not for Aaron and Brian. You know, I've thought about this story a lot and how it is so similar to life. The current in the seemingly peaceful lake is like the sin in our lives that, try as we can, we all get caught in and cannot escape. It's leading us to the rocky waterfall that is our certain death. We see the rock and grasp onto that for safety. I used to think the rock in this story was like Christ, but I was dead wrong. You see, the rock didn't save me. I was using my own strength to cling onto that rock, which is what many of us do in our own lives. We realize that we're sinners. It's obvious, isn't it, that we all mess up? None of us is perfect. So we try with all our might to cling onto our "good deeds" and trust those to save us. We go to church every Sunday, we give to the needy, we act like perfect "Christians." Those things aren't wrong, but the problem is that we can't hold onto that forever. The current of sin is too strong and we're bound to fail. The rock of good works is slippery and eventually we will all slip off and fall to our eternal death. No, my true salvation in this story was the boy who pulled me out. All I had to do was reach for him, putting my faith in him to save me, and he was there to rescue me from my despair. How silly it would've been for me to deny his help and tell him I was fine holding onto my rock. But so many of us do that. We tell God that we don't need his salvation, we're "good enough" and can make it just fine on our own. It would be a better parallel if my rescuer had to give his own life to save mine. And a terrible death at that. Which is exactly what Christ did for us. He saw we were headed to our certain death (yes, I mean hell) and the only way to rescue us was to give His own life for ours. His own perfect, holy life. All we have to do is put our faith in Him alone to rescue us. Nothing we could EVER do on our own can save us. So, sorry to be so "preachy," but I guess I shouldn't apologize for just wanting you to rethink where you stand. It's the single most important decision you'll ever make. It effects your eternity. Are you clinging onto your own good deeds, hoping they will save you? Or have you reached out for your one true Savior who loves you enough to give His own life for yours? I beg you... reach out for your Rescuer. 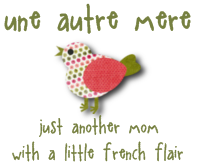 Seriously, I love H-Mama's blog. She's such a fun, loving mama to her two beautiful girls. And you can't pass up this giveaway! So head on over today! So I was alerted this morning to the fact that my blog was lookin' funny. It looked normal on my computer, but not on a few of my friends'. I guess something was showing up saying I had exceeded my PhotoBucket limit or whatever. I don't even have a PhotoBucket account, so I did a little research and found out that whoever created my template must've exceeded their limit. I decided the best way to remedy this would be to just do away with that template and find something on Blogger for now. So this is temporary until I find something I like better. I said I'd never do it. My husband begged me never to do it. But the more I saw it, the more it kinda grew on me. I decided I did want to do it after all. My husband caved and decided I was a big girl and could do what I wanted. He said he trusted me to do it right. I bought my first pair of "skinny jeans." How could I resist with a great sale at Target plus a $3 off coupon?!? I cringed at first when I looked down at my ankles and saw a sight that had been familiar to me in my much younger years. Could I really pull this off? I wasn't so sure at first, so my first outing in them, I wore big furry boots to cover them up. And since I had bought the jeans one size bigger than normal (on purpose - so I could have a little breathing room! ), no one was even aware of the bold fashion statement I was sporting. Yesterday I thought I should try to be a little bolder. So I headed out to the mall in my skinny jeans, a long sweater (to cover my bum, of course!) and a pair of flats. I don't even know why I was hesitant about it. Once I got to the mall, I didn't even remember I was wearing such a "daring" fashion statement. In fact, I blended in so well with everyone else that I didn't even feel that cool after all. It made me wonder... How many of you have caved to this fashion trend? How many of you bought them when they first came out? Who is still hesitating? Who thinks I'm so last year? I'm dying to know! ...in my car with these two sweeties snoozing soundly in the backseat. So we headed to Great Clips. I think I could maybe do it myself next time, but this being my first boy, I had NO idea how to cut little boys' hair. I've cut Chad's, but that's waaaay different. Unfortunately, I don't have any pictures of Tate's first haircut because I had to hold him tightly while he was screaming (yes, literally screaming) and clinging to me for dear life. Poor little guy. Poor hairstylist. Poor everyone within earshot. So after that traumatic experience, and since we had to be at a doctor's appointment soon and we were starving, I thought we all deserved a little Wendy's. Tate checkin' out his new 'do. Millie thought she should show you what she was eating too. There's a nugget in there. Sorry. And there's her "I was just being silly" smile. Do her eyes look a little pink to you? Hmmm... they are. Can you guess why we were headed to the doctor? Good thing no one caught me stealing that little cutie in there (there's no way I could afford her!). And on the way home, they both fell asleep within a few minutes. So I pulled into the garage, kept the kid music playing, grabbed my laptop and brought it out to the car to get some work done while they slept soundly behind me.